Joint custody arrangements may be difficult, especially after a painful relationship with your ex, but co-parenting may be the best option for your children. Try to establish a mindset that you are building a new relationship with your ex, one that centers on the well-being of your children, your number one priority. Establish consistency by providing a healthy, secure haven for children to adjust to changes in their lives. Protect your children from the stressful situations generated by divorce knowing that they may be as angry as you are about the changes in lifestyle after separation. Communication through attention is how we really communicate with our children and will console children before, during and after divorce. The following guidelines may help with the transition in communicating with your ex and setting the stage for successful parenting. Set a tone like you are speaking with a business associate. Listen to your ex. You may not agree, but you can be reasonable. Set guidelines for communications to be about the children for the present and immediate future. Avoid the past and negative experiences. Respect each other’s schedules and each other. Remember, the children are number one. Should the conversation get heated, defer to a later time if possible. E-mail and texts have certain benefits such as documenting divorce communications as well as not being able to hear the tone of the other person’s voice. At times, this may be a necessity. Know the importance of facing major decisions together: medical issues and education (if you have joint legal custody), as well as the financial obligations of each party. Know the value of compromise. Try to establish lifestyle rules, such as homework guidelines, curfews, and off-limit activities that are somewhat consistent between parents. By letting bygones be bygones and getting on with your life, your co-parenting partnership may show the kids that they may be confident of the love of each parent. This sets the stage for a successful joint custody arrangement with the goal of well-adjusted, secure children. Here at Stange Law Firm PC, we offer a broad spectrum of legal services in family law, including divorce and separation, child custody, child support and family violence. Regardless of the issues you face, we offer a free, one-hour consultation. 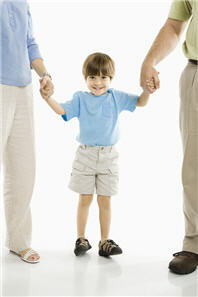 Call us at 314-963-4700 or contact us at St. Louis Parenting Plan Attorneys in Child Custody Cases.